Lorelei and I went to Forever 21 on Friday afternoon - she was looking for an outfit for a wedding, and I was just goofing around. 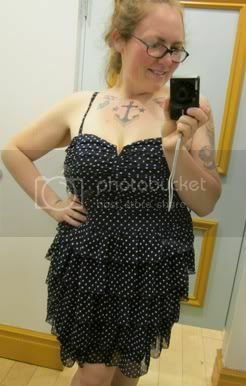 I totally fell in love with how this dress looked and fit - and the fact that it fit at all! It wasn't expensive, but I still didn't get it ... I need to be careful with my finances these days. Which is really tough, because everything cute fits now, so all I want to do is buy adorable new clothes. (1) I lost 3 pounds, down to 209. T-10 pounds to onederland! (2) I did not weigh Monday but was back on Tuesday and daily since. My goal for this week: no weighing myself Tuesday or Thursday. (3) I biked 26 miles, for a challenge total of 110 miles (exactly 50% of my goal!). (4) Finally! I logged over an hour of Wii Fit time. I finally found the 22nd flag of the Advanced Course of Island Cycling, which is an awesome calorie burner - getting all the flags takes me 10 minutes and burns 40 calories, which is really good considering most activities aren't real calorie roasters anymore. (5) I met this goal last week but I've still been working on my 101-in-1001 list. This week, I completed #34 (Move my blog to my own website) and made progress on #16 (Read 25 English books) and #19 (Reread five books that I loved as a kid). (6) Tried new thing #1 of 5: I've been running silent. I'm so music dependent during my runs, and I wanted to try just enjoying the run (also, I'm getting kind of bored of the same 20 songs). It's tough at first, but I really like it. I got my eyebrows waxed ... and my lip. I've never had my lip done before, and recently I've been super self-conscious about it. I'd never really noticed it before, but lately it's all I focus on in the mirror. Problem solved, and I feel super lovely. What goal are you having the most difficult time with? Do you have a plan to make it better? Using the Wii! This should be the easiest one! It should be a little easier now that the semester is over - I'd like to try and wake up and do a little each morning. This week, I need to really start working on goal #7 (my plan for summer/fall) - I can't sit around the house snacking and feeling sorry for myself, which is unfortunately pretty much all I did this weekend. I have to have some sort of schedule so I stay busy and focused. What goal are you rocking? Do you plan on keeping up the momentum? Pushing forward with getting to onederland and totally blazing through my 101-in-1001 list. I'm doing my best to keep moving with them! 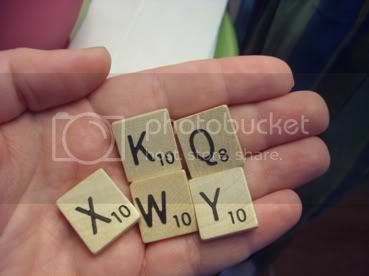 Scrabble - it was my great aunt's favorite, she and my grandmother used to play for hours and I'd just sit and watch. I have three boards: a deluxe turntable one (the pieces don't slide everywhere, it's great! ), a Super Scrabble one (bigger board and more tiles! ), and a French one (different point values for letters - tough but really interesting!). The dress IS super cute, but do you know what I love even more in that photo? The look on your face! Love it!! I love scrabble. But no one will ever play it with me. I beat a scrabble loving friend 150-70 once and she wouldn't play with me again (to be fair I moved to a different continent less than 2 weeks after). I beat my dear husband and his friend by more than that. So no one will play with me. I got addicted to words with friends when I had my iPhone. It might be the only thing I still miss about it. Glad you're having a great week! That dress looks great on you! It's probably one of the most amazing feeling you can have when you finally fit into clothing in a store you would never had dreamed to shop in. But don't worry too much that you didn't buy it, in a few more months you will be too skinny to even fit it anymore. You are doing so great. Keep rockin' on! Love the dress! Wish you could have gotten it! Love the dress :D It really looks amazing on you! I've recently become obsessed with playing the scrabble app on the ipod. It's so much fun! I love getting my eyebrows waxed, I do it every month! I love Scrabble too! I'm decent at it, but I think next to Scrabble enthusiasts I would do terrible. Good for you! And cute dress. I've walked through that store once before but never really spent time shopping there. I have some friends who love it! LOVE the dress!! :) You look great in it!! :) Also love your tattoos...very cool.